Can You Train Chickens to Play the Xylophone? I'm sure some of you have seen the YouTube videos posted by Two Creative Chicks of their chickens playing the xylophone that have gone viral. Not only is it super cute, the chickens seem to enjoy it, and with our long winters here in Maine, I'm all for anything to help beat the winter "coop fever" that can sometimes set in. So I set out to find out just how easy it is to teach chickens to play. 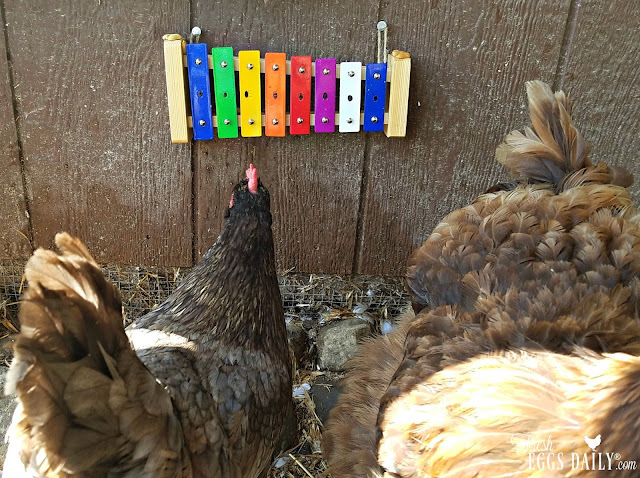 The chickens over at Two Creative Chicks seem to love playing their xylophone so much, I was curious...maybe chickens are born with some innate musical ability? Was I actually depriving my flock by NOT supplying them with musical instruments all these years? Now I felt bad. So, I did what anyone who loves their chickens would do - I ordered a xylophone for my chickens! 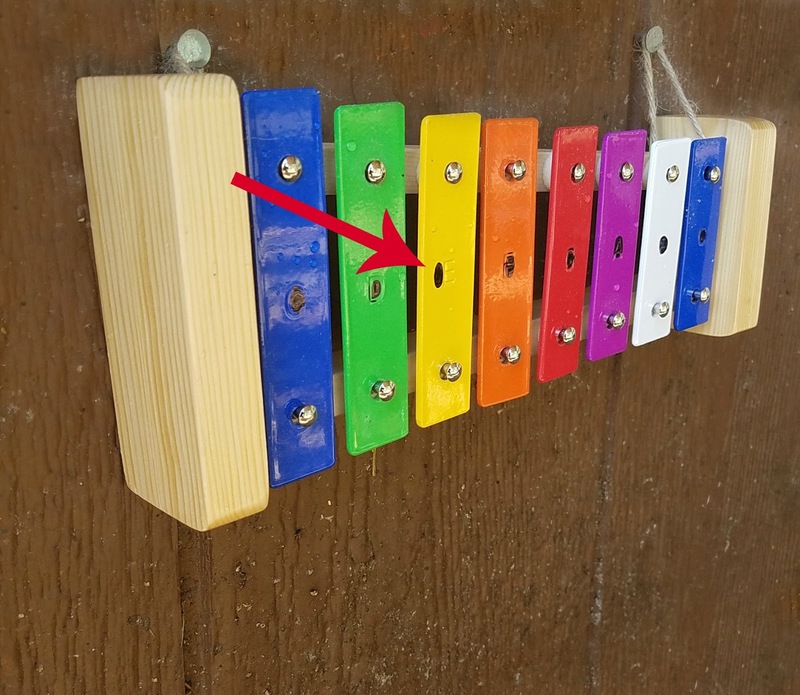 While I was waiting for the xylophone to arrive, I nailed two nails into the side of the coop about chicken eye level where I was planning on hanging the xylophone, but then I stopped and thought a bit about chicken behavior. I thought about how chickens are highly treat motivated and they like to peck at anything that looks like a bug (such as a freckle on my arm) or anything red (chickens are naturally attracted to the color red). I also realized that chickens aren't in the habit of looking up for treats, since they find most of their treats on the ground. So, when the xylophone arrived, I drew a small black dot on each key with a black Sharpie. I hoped the chickens would think they were bugs or sunflower seeds and try to peck them. Then I set the xylophone on the ground. Nothing. My normally oh-so-curious-about-anything-and-everything chickens completely ignored it. So then I had another brainstorm. I put a peanut half on each key. Now THAT got their attention. As you can see in the short video I took, the chickens LOVE their new xylophone...as long as there are peanuts on the keys! A bit deflated, I hung the xylophone on the side of the coop and left the girls to their own devices. I was working out in the yard for the rest of the afternoon and kept an ear pealed for the melodic sounds of a xylophone coming from the coop - sadly that was not to be. But I'm not ready to give up yet. Maybe my chickens just need to get used to the xylophone and will eventually get curious enough to start playing. I'll keep you posted! In the meantime, has anyone else tried to teach their chickens to play? I would love to hear any tricks you care to share. Now watch the professionals over at Two Creative Chicks! So bottom line, apparently chickens aren't born with any musical inclination, but it IS clearly possible to train them to play. 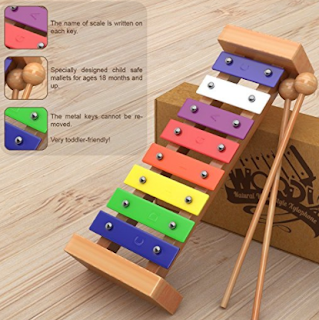 So if you have $16 to spare (or happen to have a xylophone lying around), and want to give it a try yourself, here's the xylophone that I bought. I still am hoping that I can get my chickens interested in playing a bit this winter!